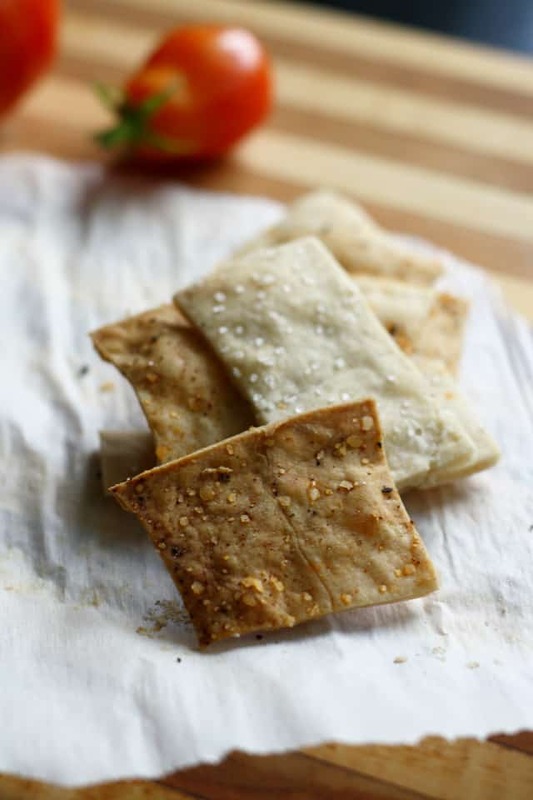 Home » Dairy Free » Easy Gluten Free Cracker Recipe. Yesterday I shared my recipe for easy and creamy tomato carrot soup. Today, I want to share a super easy gluten free cracker recipe. 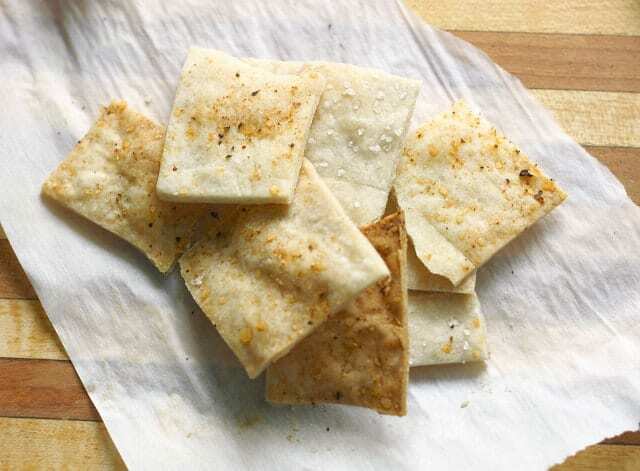 I posted two gluten free cracker recipes previously, and this one is similar, but has more of a salty, buttered flavor…kind of saltine-like, which is just perfect for serving with soup. It’s quite easy to make your own gluten free crackers, and it’s much less expensive than buying a box of gluten free crackers from the store. 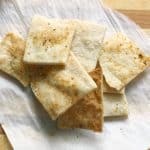 There are a few tricks to getting these crackers to turn out well, but once you’ve mastered the basics, you’ll be surprised at how quickly you can whip up a batch of these gluten free crackers. You may need to adjust the amount of liquid depending on the brand of flour that you use. The dough should not be crumbly – if it is, add a bit more water. Rolling out gluten free dough can be tricky – make sure you use two pieces of parchment paper. Keep an eye on these as they bake – if the edges are thinner than the middle, they may get done first. You can remove the edges once they are done, just be careful and quick. These homemade gluten free crackers are super easy to make and much cheaper than store bought varieties. ½ teaspoon honey or agave nectar if you are vegan! Preheat oven to 400 degrees. In a medium bowl, mix together the olive oil, melted buttery spread, and honey (or agave nectar). Add the gluten free flour blend and sea salt , and 1/4 cup of water. Stir until the dough is thick and comes together into a ball. If the dough is dry and crumbly, you will need to add more water, but just add a little bit at a time, don’t overdo it. *(Some gluten free flour blends will require more water to form a dough). Place the ball of dough between two pieces of parchment and using a rolling pin, roll until very thin, about 1/8 inch thick. Try to keep the dough the same thickness, even at the edges, to avoid burning. Remove the top piece of parchment paper from the dough. Keep the dough on the bottom piece of parchment paper and move onto a cookie sheet. Using a very sharp knife, cut the dough into 1.5 inch squares, but do not separate. Sprinkle a little water on the dough, and smooth over the squares with your fingers. Sprinkle sea salt or seasoned salt on top of the squares. Bake at 400 degrees until crisp, about 15-20 minutes. Rotate the cookie sheet after about ten minutes. Keep your eye on the crackers - it could take a little more or less time, it really depends on the gluten free flour blend that you use and how thin you roll the dough. Let crackers the cool fully on the cookie sheet, then break apart. If you have any left over, store in an airtight container. We hardly ever have any left though, they are so tasty! I have successfully made these homemade gluten free crackers using the following flour blends: Trader Joe’s Gluten Free Flour Blend, Pamela’s Products Gluten Free Artisan Flour Blend, Mrs. Glee’s Gluten Free Performance Blend, Bob’s Red Mill Gluten Free 1-to-1 Baking Flour, and my own gluten free flour mix. You should just plan to make a couple batches of these…they go sooooo quickly! « Creamy Dairy Free Tomato Carrot Soup. Could I use chickpea flour? I can’t tell you how good these are! Thanks for sharing. I would love anymore recipes that are gluten and vegan free! Thank you for a fantastic recipe. I add many different things to the basic dough like fresh herbs, especially chives, nigella seeds, sesame seeds and sometimes finely grated romano cheese. I’m so pleased to have a simple fail safe recipe that doesn’t upset my stomach. Great recipe as is. I’m saving this as my basic recipe, but will be trying other added ingredients to make flavored crackers, as well. Thank you for this simple recipe. Can these be frozen? It would be nice if you included storage of your product in your recipes. I dislike waste. Thank you! Hi! Would this recipe work with the Namaste brand gluten free flour? Thanks! What about making gluten-free crackers out of stale leftover gluten-free crackers? What is the best way to store these and how long do they last? Looking forward to trying them! Store in an airtight container. I think they would last up to a week! I made these to take camping, we have 3 kids (2 tees one preteen) with celiac, and 2 who don’t. Then the Dr added no dairy and egg restriction to my oldest, and I was desperate for snacks that are pack able. My kids devoured the first batch in 5 minutes, (and with rave reviews from celiac and non celiacs ) so today they are all at friends houses and I made a double batch that they won’t know about until we are camping. Thanks so much for this easy and tasty recipe. We eat a ton of guacamole and hummus and this will be a nice change from tortilla chips! Yay! I’m so happy these were a hit! Thanks for letting me know! Made these with my six year old little brother. He said they are the best crackers he’s ever ever eaten. I completely agree. :) Thanks so much for sharing the recipe!! My Grandaughter ( youngest ) has Celluac disease and loves saltine crackers. Do you’ve have a saltine recipe. I don’t have a saltine recipe yet, I’m sorry! Okay thank you. Please forgive misspelled words. I’m leagally blind and even with a magnifying glass it’s still a challenge. When I first looked at this recipe I prepared myself to be disappointed, it was too simple. But boy oh boy they’re great! I must’ve made them 30 times now, I substitute maple syrup for honey, and have added Tuscan spice, nutritional yeast, smoked garlic among many other flavours. Every time they’re perfect. About to enjoy a batch of seasame seed ones with some vegan cheese, and I can’t thank you enough for this recipe. Yay! So glad you like them! Your variations sound fantastic! I, too, make my own gf flour blend. Can I substitute psyllium power for the xantham gum or guar gum? I was also wondering about psyllium, ground flax, ground chia seeds? Yes, regular dairy butter is fine! I used a self-made flour mix with spelt- and rice-flour and arrow-root-starch combined with 1/2 teaspoon xanthan-gum that I’ve seasoned with Za’aatar, ground pepper and fresh thyme. After the cracker have cooled, topped it with a spread of black olive tapenade and fresh thyme and basil. I’d love to have these on hand for casseroles. Any idea if you can freeze them in an airtight container? I have not tried that, but it seems like they would freeze just fine. Let me know if you try it! I’d like to try this recipe but here the gluten free flour blend is really expensive, I usually use different types of flour or mix them myself. Do you know which ones will suite for the crackers? I just made for my son but I kept eating them! It is soooo good!!! Thank you so much!!! Hello, I am going to try this recipe. I am using King Author GF flour blend do you know how much Xanthan gum I should add to the recipe? I’m sorry, I don’t know! King Arthur Flour does not contain either xantham gum or guar gum? If it does not, I would check on the box for the amount to add to the mix. Kelly, they turned out so so hard. Any ideas? Nice taste, tho. They are definitely a crunchy cracker, but not in an unpleasant way! Maybe they got a bit overdone? Or you could try adding a bit more oil or water…every gluten free flour blend is a little bit different. I’m sorry they didn’t turn out the way you wanted them to! Yeah, I’ll try again. It’s not your fault, I’m sure. I make my own GF flour “blend” so I’ll tweak it a little. Thanks, tho – I put dill and garlic on and they were great with hummus. Hi there ! I want to try these but I’m just wondering, I made my own gluten free flour blend and know that I am to add 1 T or t (have to double check) of guar or xanthan gum per cup of flour once I want to use my flour for baking. Would I do the same with this recipe and add the spoon of gum to the one cup of flour ? Yes, if your blend does not include xantham gum or guar gum, then you would need to add it to this recipe. Hope you enjoy them! These are very good. I forgot the honey, but didn’t miss it. I added pumpkin seeds and sunflower seeds and used the rolling pin to press them in. Delicious!! Those sound like good additions! I love sunflower seeds! Do you know if these would work without the vegan ‘butter’? I would like to use something less processed as my boy has allergies. Would apple sauce work against the flavours? Hi, I can’t wait to try this! Do you know of a GF flour blend that doesn’t contain tapioca? I have some trouble with it, but can’t seem to find a blend without it. I am so sorry, I don’t know of a brand without tapioca. I just checked the three brands in my pantry and they all contain tapioca! :( Could you try making your own blend? I know there are a lot of recipes online. The best gluten free crackers I have ever eaten! The dough does not stick and is easy to work with. We do not have many GF flour blends to choose from here in Czech, so I mixed regular GF flour with a bit of rice and corn flours and it worked great. Thanks for this recipe, Pretty Bee. just to let you know it can’t be vegan if it has honey in it…. Of course you are right, the vegan category was mistakenly checked. I have corrected it. You could still make these vegan though, just leave the honey out or sub with agave! This actually isn’t completely true! I know some vegans who keep bees, solely so that they can collect the hive’s overflow honey. This is honey that leaks out of the hive over time, and would just drip onto the ground and be wasted. You CAN be vegan and still eat honey, without exploiting even bees, and even while PROMOTING and HELPING bees. It’s true you can’t go grab honey off the grocery store shelf, but it is possible to be a vegan and eat honey. Certainly! Lowercase t stands for teaspoon, and uppercase T stands for tablespoon in all of my recipes. Hope you like these! I am totally going to try these! We aren’t vegan and stick mostly to butter rather than spreads. Should I be able to substitute butter for the butter spread and have it turn out ok? Yes, butter will work just fine, Kristen! I’ve never made homemade crackers before, but I’d like to try it – much simpler ingredients than store bought crackers! Do you have a favorite gluten free flour mix that you use regularly? Janelle, I like the Namaste Perfect Flour Blend, and I also like the Trader Joe’s blend!